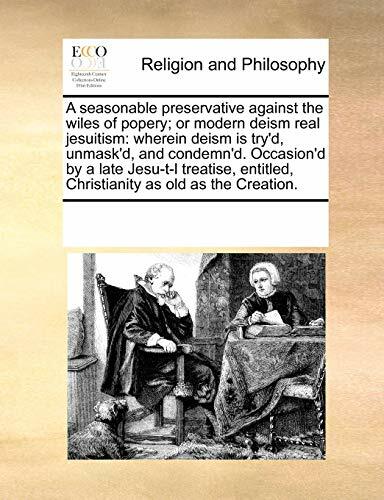 See Notes Multiple Contributors A seasonable preservative against the wiles of popery; or modern deism real jesuitism: wherein deism is try'd, unmask'd, and condemn'd. Occasion'd by ... Christianity as old as the Creation. A seasonable preservative against the wiles of popery; or modern deism real jesuitism: wherein deism is try'd, unmask'd, and condemn'd. Occasion'd by ... Christianity as old as the Creation. With a half-title. 'Christianity as old as the creation' is by Matthew Tindal. 5. A seasonable preservative against the wiles of popery; or modern deism real jesuitism: wherein deism is try'd, unmask'd, and condemn'd. Occasion'd by ... Christianity as old as the Creation. 6. A seasonable preservative against the wiles of popery; or modern deism real jesuitism: wherein deism is try'd, unmask'd, and condemn'd. Occasion'd by ... Christianity as old as the Creation. 7. A seasonable preservative against the wiles of popery; or modern deism real jesuitism: wherein deism is try'd, unmask'd, and condemn'd. Occasion'd by . Christianity as old as the Creation.